The royal hunting lodge at Havering possessed a wooded estate that encom­passed all the land and buildings between present-day Havering-atte-Bower and Collier Row. The park was divided into farms in the 1650s, after monarchs had ceased to use the house. Late in the 18th century Havering Park Farm became one of the progressive farms for which the area was noted, pioneering advanced agricul­tural methods. The park was also the site of Hampden House, a mansion occupied by a succession of London businessmen and merchants during the 19th century. Following the creation of the Eastern Avenue in the mid-1920s, a variety of property developers piled into the area. The largest of these was TF Nash, who bought a large chunk of land north of Collier Row Road for a planned estate of 9,000 homes. Nash himself lived for a while at Hampden House and his firm laid on its own bus service for the estate’s residents. By 1939 2,000 houses had been completed. Building continued into the war until work was suddenly halted. After the war green-belt legis­lation prevented the estate from spreading further into the countryside. Many of the more dreary properties have since been disguised with a variety of cladding materials. 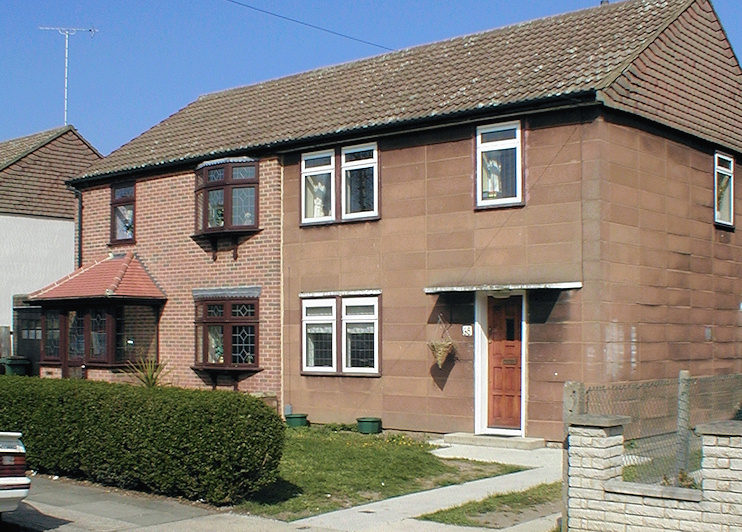 The photo above shows a pair of homes in Havering Park: one brick-clad and one still in its original state. Havering Park’s name is not in widespread use, although it is a bus destin­ation and the council has desig­nated it a ward. In that ward 88 per cent of the residents are white – almost all of them white British. Fewer than 10 per cent of those aged 16 to 74 are qualified to degree level or higher. More than a third of house­holds contain dependent children. Havering country park, which lies between the estate and the village of Havering-atte-Bower, has mature woodland, ponds, hay meadows and two grassland conser­vation areas.